What does a Crop Scientist do? Crop scientists, also known as agronomists, produce and improve the quality of crops that we consume. These scientists develop new methods for keeping pests and weeds at bay. Crop scientists work in a variety of settings, including laboratories, offices, or places where crops are grown. They occasionally work outside in all kinds of weather, and travel to different locations. I’m a Research Scientist with CSIRO Plant Industry, Narrabri, NSW. In this role I lead research into cotton crop irrigation, looking at the relationship between plant stress, soil water levels and climate. The aim of this research is to develop a new approach to irrigation scheduling, using water more efficiently while maximising the yield for cotton growers. The aim of my PhD research was to improve the understanding of growth and development differences in cotton planted in conventionally spaced (1metre) rows, and ultra-narrow rows which are used in high-input production systems in Australia. Before completing my PhD thesis I was offered a postdoctoral fellowship position with CSIRO. I then moved to a commercial seed company and spent a year as a Trials and Seed Increase Agronomist, before moving back to CSIRO where I completed a second postdoctoral fellowship. Bachelor of Science (Environmental Biology), University Technology Sydney. 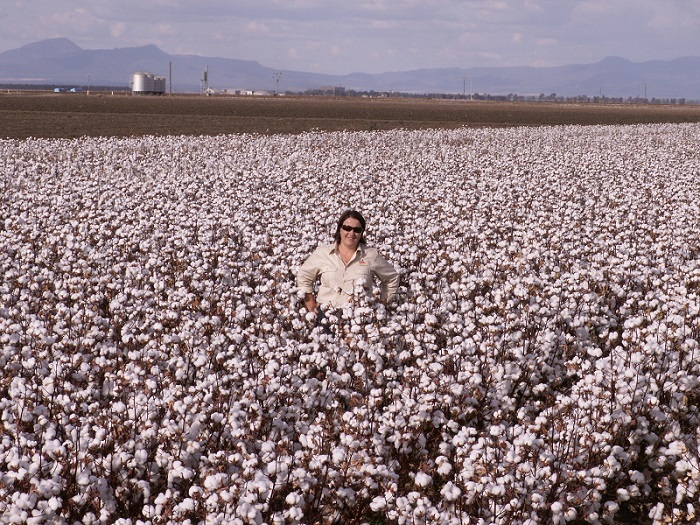 During her PhD Rose investigated how cotton grows under different row spacing and plant density. Working with growers and the industry, getting their feedback and having a real impact on improving production practices is the best thing about my job. The close collaboration with industry, and seeing successful outcomes, is what makes my work feel relevant. I know my job as a CSIRO crop scientist is right for me, because even under difficult conditions, I really enjoy what I do. I think that if I can be ankle-deep in mud, measuring soil water for my experiments in 44 degree heat, and enjoying it, then I must be in the right field. A PhD is a prerequisite qualification. I had a CSIRO PhD scholarship and my PhD project was based at the CSIRO Cotton Research Unit in Narrabri. I think I had the best of both worlds. My university supervisors were fantastic in providing support and direction and I got to conduct my research based at the research station in Narrabri located within the heart of the cotton industry. This broadened my experience during my PhD studies and I made excellent connections with industry and helped develop the skills required for my current job.